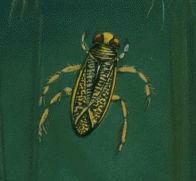 Heming, B.s.. "Bug". The Canadian Encyclopedia, 16 December 2015, Historica Canada. https://www.thecanadianencyclopedia.ca/en/article/bug. Accessed 24 April 2019. Bug is the name properly applied to a member of the order Hemiptera, the most diverse order of insects having incomplete metamorphosis. 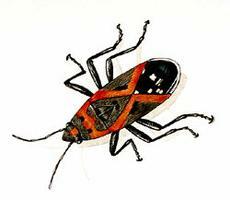 Bug is the name properly applied to a member of Hemiptera, the most diverse order of insects having incomplete metamorphosis (artwork by Jan Sovak, 1989). Bug is the name properly applied to a member of the order Hemiptera, the most diverse order of insects having incomplete metamorphosis. Over 55 000 species have been described worldwide about 3080 species (of a probable 4226) in Canada. Bugs are most closely related to thrips and probably shared a common ancestor in the Carboniferous era (353-300 million years ago). They range from 0.1 to 9 cm long and are classified into 2 suborders: Heteroptera (true bugs) and Homoptera (including cicadas, leafhoppers, aphids, scale insects and mealy bugs). Bugs are widely distributed across forested and prairie regions of Canada, but a few species occur in the Arctic or Subarctic. In a given area, species diversity is usually related to host plant diversity, since most bugs are host-specific. Although bugs are generally terrestrial, some (eg, back swimmers, water boatmen and giant water bugs) are aquatic. Most semiaquatic bugs (eg, pond skaters and saldids) prey on other small arthropods. All bugs have piercing and sucking mouth parts. Most bugs feed on vascular tissues of higher plants but many true bugs eat other insects or take blood from vertebrates, including humans (eg, bedbug, Cimex lectularius). Most adult bugs have 2 pairs of wings, 2 large, compound eyes, and 2 or 3 dorsal ocelli (simple eyes), but a few are wingless or vary in wing length and have their eyes reduced accordingly. Forewings in heteropterans are hemi-elytra: the basal half is opaque and stiff, the apex transparent and membranous. These are folded flat over the abdomen when not in use. Forewings in homopterans are either transparent or opaque throughout and are folded, rooflike, over the body. True bugs have 5 immature stages, homopterans 3 to 7. Whiteflies and male scale insects have 1 or 2 nonfeeding "pupal" stages. Female scale insects reproduce while still immature; males lack functional mouth parts and are short-lived. Most bugs have separate sexes and deposit eggs, but some (eg, aphids) are parthenogenetic (eggs develop without fertilization) and viviparous (deposit live young). In Canada, 112 species of Hemiptera, including plant bugs, aphids, leafhoppers, psyllids and scale insects, have been recorded as crop pests. Their feeding can kill or deform seedlings, reduce plant vigour and lower seed set by damaging flowers or seeds. Many aphids and leafhoppers transmit plant diseases. Large populations of aphids and scale insects excrete "honey dew" onto leaves of host plants, providing a substrate for growth of photosynthesis-inhibiting "sooty mold." Many predatory heteropterans are beneficial to humans because they feed on insect pests. J.A. Slater and R.M. Baranowski, How to Know the True Bugs (1978).